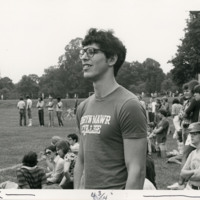 Man with glasses wearing a T-shirt reading, 'Bryn Mawr College', on sideline of fieldhockey field. There is a large crowd of students on sidelines as well. Some students on field but not as athletes.